Dr. Joshua Prager, Director of the Center for the Rehabilitation of Pain Syndromes at UCLA Medical Plaza, along with his patient Andrea Sherman, discuss a drug-free approach to managing chronic pain. Dr. Prager is a faculty member in the Department of Internal Medicine and Anesthesiology at UCLA. Dr. Prager’s clinical practice focuses on Complex Regional Pain Syndromes, Neuromodulation, and precision spinal diagnostics and therapeutics. In addition to his clinical practice, Dr. Prager has also served under oath as a medical expert witness in many cases such as pain and suffering, worker’s compensation, and disability. Andrea Sherman, Dr. Prager’s patient, was involved in an accident 20 years ago working on the set of a children’s TV show, which resulted in chronic regional pain syndrome (CRPS). To manage the pain, she was put on opioids, had multiple surgeries, and tried countless doctors, acupuncture and injections treatments. She then underwent surgery to have a spinal cord stimulation (SCS) device implanted. Andrea’s pain subsided, allowing her to sleep for the first time in seven years and discontinue using opioids. Neal Howard: Welcome. I’m your host Neal Howard, glad that you could join us today. As the opioid crisis rages on, pain specialists are looking into some alternative ways to treat pain that don’t rely on addictive prescription painkillers. 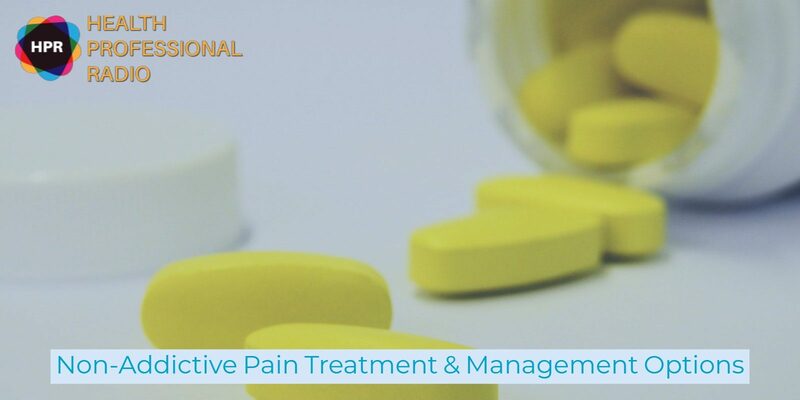 In fact, a drug free approach is offering people in a very effective way to manage their chronic pain. Here to explain this latest tactic in fighting the opioid epidemic is Dr. Joshua Prager director of the Center for Rehabilitation of pain syndromes at UCLA Medical Plaza along with one of his patients, Andrea Sherman. Welcome to the program both Dr. Prager and Miss Sherman, how are you both? Dr. Joshua Prager: We’re doing well Neal. Thanks for having us. Neal: Thank you for taking the time. Dr. Prager, just a bit of background about yourself other than what I told our listeners about you and talk a little bit about what constitutes chronic pain as opposed to regular pain. Dr Prager: Well briefly, I’m on the board certified pain specialists who’s been practicing pain medicine for 25 years at UCLA and just about when I started, I started using neuro modulation and neuro modulation is a technique that avoids systemic medications, avoids opioids, avoids the potential for addiction. And Neal, we know now that the largest percentage of patients who become addicted to pain medications or to opioids start by having a physician prescribe medication and then either that medication gets diverted to a family member or the patient himself becomes addicted. So we have a drug free alternative that has not only been around for 30 years but continues to get refined. So in the last five years, it’s become a lot better. The devices are smaller, they’re now smaller than a pacemaker and they provide pain relief using electricity and minute electrical signal gets sent to the central nervous system, blocking the pain signal from the periphery to ever getting to the brain. So if you have pain in your leg or pain in your arm, that pain signal doesn’t get to your brain. So not only do you not feel it but you avoid the devastating effects, the effect on your family, the effect on your ability to work. Neal: Well understanding that the burden of chronic pain is very serious. Does this technique work on pain in general or is it specifically for pain that is determined as chronic? Dr Prager: Well we wouldn’t be using this technique for acute pain. We use this after pain’s been around for at least three months and the patients failed other therapies. Neal: Andrea, you’re a chronic pain sufferer. How did chronic pain affect your life and how are you managing it today? Andrea: I was in my late 20s and in the beginning of a really great career. I was working on a set of a television show and one of my co-workers was messing around and bent my wrist back and I heard a pop and then that was basically the end of my career and the end of the use of my right hand. And I was right handed at the time so I went to the doctor, no one could figure out what was wrong and in the meantime the pain just kept getting worse and worse and worse and I was put on opioids and they didn’t really help but there was nothing else that helped any better. Year after year, I just kept getting worse and worse and worse. My life was going on but I wasn’t really a participant in my life and I finally got referred to Dr. Prager because I was in excruciating pain and it was just a vicious cycle. So Dr. Prager recommended a spinal cord stimulator and I thought that was crazy, ‘Who wanted an implanted device?’ But I at that point, I was in so much pain, I thought ‘Okay, great.’ The next morning after the trial I called him and said “This is the best night’s sleep I’ve had in six years and when can I get this thing permanent?” Because after having what felt like burning hot knives poking into my arm constantly 24/7, all of a sudden I felt something totally different. It blocked that pain message. So fast forward to almost 20 years later, I was able to raise two kids on my own, build a business and now I’m virtually pain free. Neal: A couple of questions. First of all, did anyone ever determine what that pop was that you heard all those years ago? And two, as far as neuro modulation is concerned, is this something that you recommend for anyone and everyone? Are there some stipulations, some certain things that made you a prime candidate for this technique? Andrea: So they did determine about nine months later that I took out a bunch of ligaments and tendons in my wrist but in the meantime, I’d also compressed a nerve. So what happened in that ensuing time is I developed chronic pain, a neurological pain condition called Complex Regional Pain Syndrome which is a whole other set of interviews that we can talk about some other time. But what made me a really good candidate for neuromodulation was that I had this long term chronic pain and from my understanding and I’m like Dr. Prager already shared with you, is that neuromodulation, the spinal cord stimulator which is a type of neuromodulation that I have blocked the pain message. And I recommend it to everyone else who has chronic pain? Absolutely. I would say by far it’s the best kind of treatment I’ve ever had. I talk to people about this, I would recommend it, at least try and to see if it’s for you. It’s a weird sensation at first but the technology now is you don’t even feel it and it gives your life back. It gave me my life back. Neal: Dr Prager, let’s talk about how invasive the procedure is and any side effects. Dr Prager: Well I would first start by talking about a little bit on Andrea has said is that a lot of patients are averse to even thinking about something that might go in the body but the trial is really non-invasive completely. You just place a wire in through a needle, you place a wire that then sends the nerves that signals to the nervous system and that tells you what kind of pain relief you would get. And you don’t have to do anything more when you do the trial than that. Now if you put the full device inside the body, that requires a minor surgery. But the thing that you have to understand about this is that it’s fully reversible. In other words, if your pain goes away for whatever reason, you take it out. It’s non-destructive. If you have a back surgery and it didn’t work, you can take it away. It’s been done. But if you put one of these in, it’s fully reversible, non-destructive, you’re back to where you were at the beginning except you no longer have the pain, if the pain got better on its own. So you really need to go and find more about this at a website that we’ve provided called askaboutpain.com and on that website, you’ll be able to find information not only a lot more information about techniques that can control your pain, but you can also find where you can find a board certified pain physician who is experienced and qualified to implant these small devices inside the body. Neal: Dr Prager, Andrea, thank you both. Lots of great information. I’m sure it’s going to be very helpful for a lot of people. Thank you again.